Radioactive particulates and gas emit alpha, beta or gamma radiations. In order to ensure public safety, those radiations need to be controlled inside and outside nuclear facilities such as nuclear power plants, nuclear fuel-cycle plants or laboratories, but also in the context of nationwide monitoring networks. Real time and accurate measurements are done with beacons or stations able to trigger general alarm systems, and able to transmit data redundantly to a central monitoring system for routine or emergency operations. With the expertise of Saphymo, Bertin Instruments has a strong and well-known experience in the field since the 80’s. 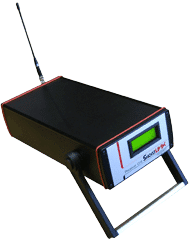 The BAB air monitoring beacon is specially designed for the continuous monitoring of α & β artificial radioactive aerosols concentration combined with radon progenies and ambient gamma radiation. The SA environmental monitor is used for continuous measurement of aerosol activities in all gaseous effluents. It can be fully integrated into environmental radiation monitoring systems.